The Trinity was a band active in the 60s, led by keyboardist Brian Auger and usually featuring singer Julie Driscoll. 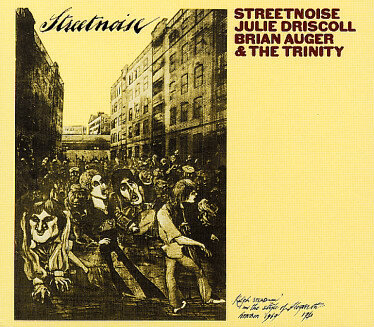 1969's Streetnoise was The Trinity's second album to feature singer Julie Driscoll. It was a double LP set, and surely their most ambitious project to date. The music it contained didn't really fit neatly into any genre, being very experimental in nature, but perhaps could be said to lie somewhere between jazz fusion and progressive rock. Driscoll didn't sing on all the songs, as it also featured various instrumentals showcasing Brian Auger's dazzling hammond organ, and numbers sung by either Auger or bassist Dave Ambrose. As well as good original songs it featured an eclectic selection of covers - The Doors' "Light My Fire", Nina Simone's "Take Me To The Water", Richie Havens' "Indian Rope Man", Miles Davis' "All Blues", Laura Nyro's "Save The Country" and songs from the musical Hair. It turned out to be the last album from the partnership of Julie Driscoll and Brian Auger. Driscoll's next release was as a solo artist, and after one more Trinity album Auger would form Oblivion Express the next year.